Promoting Glasgow internationally as a vibrant, welcoming and world-class destination which is open to visitors, students and businesses post Brexit is at the heart of a new city initiative. With potentially any form of Brexit threatening to put Glasgow at a serious economic disadvantage in the weeks and months ahead, a new Global Glasgow steering group has been convened from across the city’s public, private, voluntary and academic sectors to coordinate a collective response to selling Glasgow to the world. Chaired by the Leader of the Council, Councillor Susan Aitken, the group – which met for the first time last week and will come together quarterly – comprises senior figures from a mix of city organisations with strong international networks and expertise. It has been tasked with creating a strategic action plan that supports sustainable and inclusive economic growth in the city and profiles Glasgow’s global reputation – as a great place to visit, study, live, work and do business – in a consistent and aspirational way. The Global Glasgow group is made up of Glasgow City Council; Glasgow Life; Glasgow Chamber of Commerce; Glasgow, Strathclyde and Glasgow Caledonian universities; Glasgow Airport; the Scottish Event Campus (SEC); Glasgow City of Science; City of Glasgow College; the Glasgow School of Art; the Royal Conservatoire of Scotland and Scottish Power among others. In addition, the group will contribute to the development of Glasgow City Council’s new International Strategy, which will ensure the city continues to collaborate and strengthen its relationships with key European and international cities. As Scotland’s economic and cultural powerhouse, Glasgow is home to the largest cultural offer, the largest sporting infrastructure and the largest retail centre in the UK outside London. The city is also recognised as having the UK’s best Convention Bureau, responsible for securing major domestic and international conference business; is a top five city for global sporting events and, in the SSE Hydro, has the busiest entertainment arena of its size in the world. Glasgow currently attracts just over two million tourists each year, spending more than £700m, while some 20 million day visitors contribute approximately £1bn to the local economy on an annual basis. As of 2018, Glasgow’s financial sector is now among the top 15 most reputable in Europe with a sectoral reputation that indexes higher than that of several more established and larger European business hubs and capitals, such as Vienna, Madrid, Brussels and Milan. 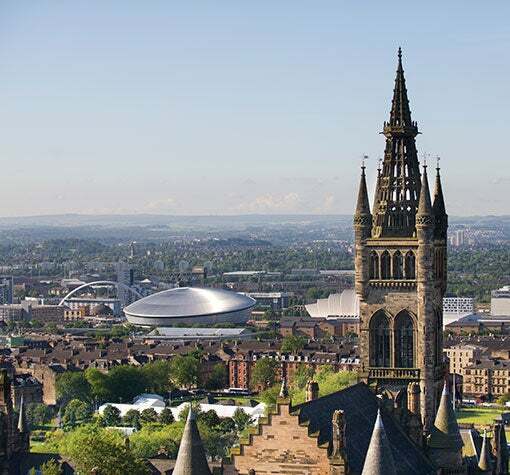 Glasgow also currently has the second best foreign direct investment (FDI) strategy among large European cities (with a metropolitan population greater than two million) and rates among Europe’s top 10 cities for overall business friendliness. The City Council, together with Glasgow Chamber of Commerce and Glasgow Airport, recently commissioned a study by leading urbanist and global advisor Professor Greg Clarke which reinforced Glasgow’s encouraging starting position. However, it also highlighted a need for a new and stronger narrative which better promotes the scale and success of the city’s business brand across international markets. Glasgow’s jobs base and economy are growing at above average rates and the city has a reputation as a leader in high-tech sectors including life sciences, low carbon and advanced manufacturing. Plans for a series of new Innovation Districts and new policies focussed on strengthening entrepreneurship will also help the city cement its position as an emerging innovation hub. Over the past five years, Glasgow has consistently ranked in the top 20 of the most innovative cities in the world and places 4th in the UK. Leader of Glasgow City Council, Councillor Susan Aitken, said: “Just this week Glasgow was named one of the world’s top 10 cities by Time Out magazine, with particular mentions of our people, our creative sector and our hospitality. “From sport, arts, culture and nightlife to the unique character of our citizens, the world knows that something is happening in Glasgow. “But we also know we continue to struggle to tell the story of our business brand, dynamic economy and record of innovation; all of which are vital elements of a new Glasgow narrative and attributes with which our global peers are increasingly measured by. Glasgow’s Lord Provost Eva Bolander, said: “As Glasgow’s First Citizen and civic head I’m always proud to take every opportunity to promote Glasgow domestically and internationally. We enjoy relationships with eight twin cities from Nuremberg to Bethlehem and have spent more than a decade supporting the people of Malawi. “Glasgow is a world-class city that is outward looking, progressive and filled with talent. We all know People Make Glasgow and it is our citizens who built and shaped this city and earned its global reputation as a friendly, exciting, dynamic and creative place. Dr Bridget McConnell, Chief Executive of Glasgow Life, said: “Glasgow is Scotland’s cultural and creative powerhouse. We’re a UNESCO City of Music and one of the world’s top five sporting cities. We’re home to world-class museums, galleries and attractions; a rich architectural heritage and Europe’s finest civic art collection. Our outstanding events and festivals are benchmarked internationally and we are increasingly a first-choice tourism destination. “Culture, sport and tourism are intrinsic to Glasgow’s success. We are leaders and innovators, and the success of our iteration of the first ever European Championships – a model which will be replicated elsewhere – is a great example of this, with unrivalled broadcast coverage showcasing the very best of what Glasgow has to offer to millions of viewers around the world. “At the same time, we know that we need to continue to invest to strengthen our reputation as a cultural and sporting leader. So we’re spending millions of pounds in transforming our much-loved Burrell Collection to unlock its global potential and drive further regeneration in the city. Stuart Patrick, Chief Executive of Glasgow Chamber of Commerce, said: “For obvious reasons this is a very pertinent time for the city to be reaching out internationally and so we welcome the establishment of the Global Glasgow group. Mark Johnston, Managing Director at Glasgow Airport, said: “Glasgow Airport is the City Region’s primary link to global economic markets and the connectivity it provides helps drive tourism, encourage exports and attract inward investment. Peter Lederer, Chair of Glasgow’s Tourism and Visitor Plan Leadership Group, said: “Tourism growth is fundamental to Glasgow’s International Strategy. If we’re to achieve our target of attracting one million more tourists by 2023, then it’s crucial that we continue to tell Glasgow’s story to the world and position the city as the gateway to Scotland. “There’s a clear trend towards authenticity in travel today; visitors want to experience real neighbourhoods and communities, and immerse themselves in local culture. It’s about connecting people and place in a genuine way. As such, the quality of our visitor experience is hugely important not just in attracting more tourists, but also new students, residents and businesses, which in turn will support the creation of thousands of new jobs in the city. Dr Susie Mitchell, Programme Director, Glasgow City of Science and Innovation (GCOSI), said: “The Glasgow City of Science and Innovation (GCOSI) partnership is delighted to work alongside city partners to build an ambitious International Strategy that strengthens Glasgow’s global educational, cultural and economic links to develop a progressive, inclusive economy that meets the needs of citizens. “The strategy provides a unique opportunity to attract new international collaborators, talent and investment opportunities to leverage and internationalise our rich science and innovation base to maintain competitive advantage in key growth areas.